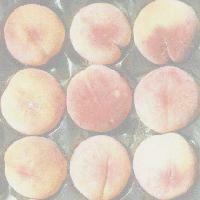 A white-fleshed peach with wonderful aromatic flavor, just as good as Raritan Rose. Medium to large in size, freestone. The flesh is soft, but a bit firmer than Raritan Rose. It doesn't keep well in the refrigerator, and it is probably too soft for canning, but eaten soon after picking, it provides an unforgetable flavor experience. Maybe you could freeze it--worth a try. Summer Pearl is greenish white on the outside with a red blush. The flesh is cream white. Ripens mid- to late-August in the Willamette Valley.